El Nido is a coastal town in Palawan. El Nido composes of 45 islands and islets, limestone cliffs are also found here which form a Karst backdrop similar to those found in Ha Long Bay, Krabi and Guilin. El Nido is a popular destination for locals during the long holidays of the Holy week, but it relatively unknown to foreign tourists. Breathtaking views of nature are the main reason to visit El Nido. The pristine waters of El Nido offer beautiful coral reefs, while its beaches are uncrowded unlike the popular Boracay, exploring the lagoons by kayaking is a great way of visiting the islets, coves and caves are also abubdant. Inland El Nido, springs and waterfalls are also found. Bacuit Bay composes of limestone islands, where its possible to either dive, snorkel or hike. El Nido is more than just a stereotypical tropical paradise - Beaches, clear waters,jungle, sheer limestone cliffs and stunning inlets make for one of the world's most beautiful seascapes. The easiest way to see the Bacuit Bay is on an island hopping boat. These boats carry around 6 people and will visit 4 or 5 islands in a day. The boats usually take set routes named A to D, but can vary depending on tides and weather. El Nido is also known water sports such as diving, snorkeling and kayaking. From the towering marble cliffs and enchanting lagoons to its 100 white sandy beaches, lush jungle and mangrove forest, prehistoric caves and waterfalls, El Nido is one of the top tourist destinations in Palawan, which is often referred to as the "Philippines' Last Frontier". In the November–December 2007 issue of the National Geographic Traveler's magazine, Palawan was chosen as one of the best travel destinations in the world, and particularly, it recommended El Nido and the Calamianes Islands. In 2012, CNNGo, the travel news website of the international news agency Cable News Network, declared El Nido as the Philippines' Best Beach and Island destination. There are a number of beaches on Cadlao, including that at Bocal Point, Natnat, and Paradise Beach on the southern side of the island. Sabang Beach in the northeast offers good snorkeling opportunities, though some visitors may recognize it as one of the settings for the Scandinavian TV show Robinson Expedisjonen, the predecessor to Survivor. El Nido Resorts refers to the resort complex operated by Ten Knots Development Corporation (TKDC), which is owned by the Asian Conservation Company (ACC). TKDC, the biggest private sector employer in El Nido, cooperates with the Philippine government in environmental conservation and management. At present, TKDC operates in two islands of El Nido namely, the Miniloc Island and the Lagen Island. The said establishment has won numerous citations both locally and internationally. The January 2008 issue of international magazine Travel + Leisure, published by the American Express Co. (which partnered with Conservation International), listed "El Nido Resorts" as "conservation-minded places on a mission to protect the local environment." Travel + Leisure’s 20 Favorite Green scored El Nido Resorts' protection of Palawan’s giant clam gardens and the re-introduction of endangered Philippine cockatoos: "8. El Nido Resorts, Philippines: Guest cottages on stilts are set above the crystalline ocean. The resorts are active in both reef and island conservation." In 2009, El Nido Resorts won Wild Asia's Responsible Tourism Award for the "Mid to Small" accommodation category for its excellent sewage treatment facility that prevents waste water from contaminating the surrounding water systems, tree-planting activities to protect the municipality's watersheds, and skills training for local communities through its own foundation. Activities offered at El Nido Resorts include lagoon tours, cave tours, mangrove river tours, bottom fishing, bird watching, hat making, picnic lunches, sunset cruising, kayaking, windsurfing, hobiecat sailing, snorkeling, diving and, with prior arrangement, dive courses. Miniloc Island, where the first resort in El Nido was established, started as a diving station for Japanese and European tourists.The tranquil turquoise-green waters of its orchid-lined limestone walls Big and Small Lagoons showcases a kaleidoscope of marine life. Scientists believe that these lagoons were actually caves which abound in these islands. The roofs of these caves must have collapsed millions of years ago, and these lagoons have emerged in their stead. The Miniloc Island Resort, renimiscent of a coastal village, is set in a cove with a backdrop of sheer limestone cliffs. The resort has a total of 50 rooms of varying types accommodations and its facilities include a restaurant located at the clubhouse, a boutique, video room, game area, Pavilion Bar, and a conference room that can accommodate up to 40 persons theater-style and 30 persons classroom-style. It has a complete diving and snorkeling facilities, as well as, kayaks, aqua bikes, windsurf, and hobie cat. The end of the resort's pier is a great place for snorkeling where guests can swim alongside 3-foot-long (0.91 m) groupers and hundreds of sergeant majors, damsel fish, fusiliers, large group of snappers, and other multi-colored tropical fishes. The island hosts a high diversity of birds including almost all of the species endemic to Palawan. The Lagen trail is one of the best sites for birdwatching, more rewarding during the early morning or towards late afternoon. Its Leta-Leta Cave was an important burial site of the Late Neolithic Age, where a collection of stone and shell artifacts, and sophisticated pottery, such as the "Yawning Jar," and nephrite adzes and axes were recovered. Other materials include stone ornaments and shell beads. It was excavated by Dr. Robert Fox in 1965.It is also one of the pitstops of the 5th Season of The Amazing Race. In one of its cove, which is fringed by a lush forest and limestone walls, lies the Lagen Island Resort, the most luxurious exclusive resort in the area. The resort complex has a total of 51 rooms of varying types of accommodation, a 12 x 25 meter swimming pool, designed with an even depth of 4 feet so as not to touch the roots of trees that lie underneath. Its clubhouse is the air-conditioned main dining area where buffet and a la carte meals are served. On the lower level of the clubhouse are the boutique, game area, library, clinic, and conference room that can accommodate up to 70 persons theater-style and 60 persons classroom-style. It has 750 meter wide stretch of powdery white beaches in El Nido, which is very ideal for sun bathing, sunset viewing, and other beach activities. 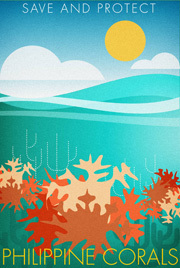 The waters fronting the beach are clusters of coral reefs that make this area a good snorkeling and diving site. A trail located in the middle of the island is a good place for birdwatching, especially during early mornings and late afternoons. The trail ends at the peak of the island and provides and an excellent 360-degree view of the Bacuit Bay and nearby islands. It is an important anthropological site, where jewelry and pottery dating back to the Sung Dynasty (960-1279 CE) were yielded. The anthropologists believe that the cave dwellers were from Borneo, and travelled across the ancient land bridge that connected Palawan from Borneo. The crevices of its cave roof are inhabited by barn swallows and insectivorous bats. Matinloc Island, the longest slim island in El Nido, has a secret beach, which is a pocket of white sand beach at the corner of a sinkhole,that is inaccessible by boat and surrounded by steep rock walls. To reach it, divers must swim underwater through a narrow crevice in a rock wall. At noon, the sun streams in through the opening, allowing a play of light and shadow against its limestone walls. The beach floor drops abruptly.According to local legend, this beach inspired Alex Garland's novel The Beach, which was written while the author was in El Nido. 12,000 years ago, El Nido was inhabited already by humans. Archaeologists found human and animal bones, potteries and even traces of 8,000 year old cremation at Ille Cave. Ille is located at New Ibajay, a 45-minute drive from the town center, and is frequented by tourists. Island Transvoyager's Dornier Do 228aircraft at Lio Airport. The fastest and most direct way to El Nido is from Manila. The flight takes one hour and fifteen minutes, and lands directly at Lio airport, which is located about 4 kilometers from the Población. There are only two airlines that fly to El Nido, namely South East Asian Airlines (SEAIR) and Island Transvoyager Inc. (ITI). ITI is a charter airline that operates as a sister company to the two main resorts on El Nido. SEAIR is a commercial airline with flights from Manila to El Nido, with a stopover in Busuanga. The main roads of El Nido are organized around a set of radial and circumferential roads that radiate and circle in and around the town proper and its rural barangays. Its interconnected roads are connected to the major highway that leads Puerto Princesa City, Palawan's capital. Daily Buses and jeepneys depart at San Jose Terminal in Puerto Princesa for El Nido. Tricycles are used for short-distance trips around the town proper. The 60 km national road between Taytay and El Nido was rehabilitated, and this has helped boost tourism and business activity in the area. The main port in El Nido, which is under the jurisdiction of the Philippine Ports Authority (PPA), is located in Buena Suerte (Zone II), although a number of small and accessible wharfs, such as the San Fernando pier, are being used in other rural barangays. A number of ferry and other sea vessels owned by Atienza Shipping Lines and San Nicholas Shipping Lines have regular trips from Manila to El Nido.